(1 each/unit) For use on 60% braid thru quad-shield coaxial cable. Enhance your ability to deliver flawless analog and digital RF communications. 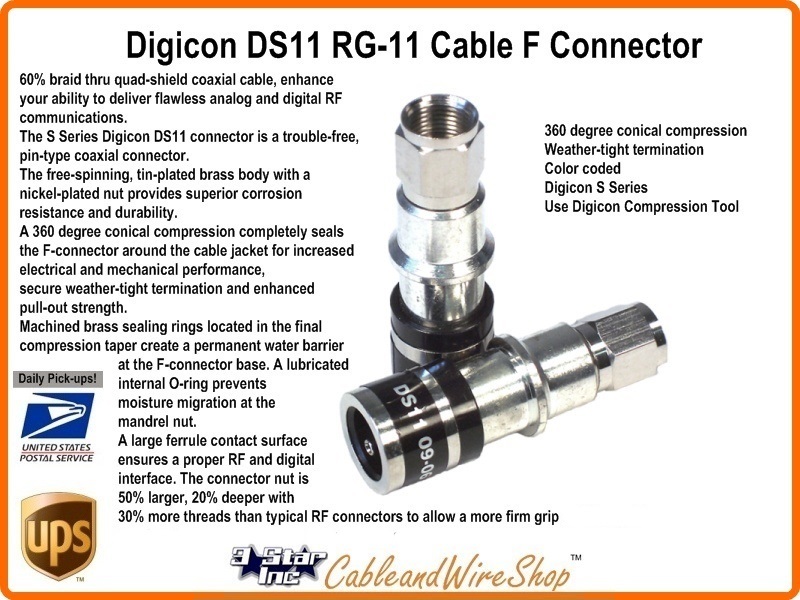 The S Series Digicon DS11 connector is a trouble-free, pin-type coaxial connector. The free-spinning, tin-plated brass body with a nickel-plated nut provides superior corrosion resistance and durability. A 360 degree conical compression completely seals the F connector around the cable jacket for increased electrical and mechanical performance, secure weathetight termination and enhanced pull-out strength. Machined brass sealing rings located in the final compression taper create a permanent water barrier at the F connector base. A lubricated internal O-ring prevents moisture migration at the mandrel nut. A large ferrule contact surface ensures a proper RF and digital interface. The connector nut is 50% larger, 20% deeper with 30% more threads than typical RF connectors to allow a more firm grip and to provide a secure weathetight connection at the port interface. For professional results, use only the proper Digicon compression tool to install Digicon F-connectors. Use Compression Tool LCCT-SS59/11, Part Number 716841. Note: This Connector takes a lot of leverage to compress, a LNS5000 will also handle this connector.